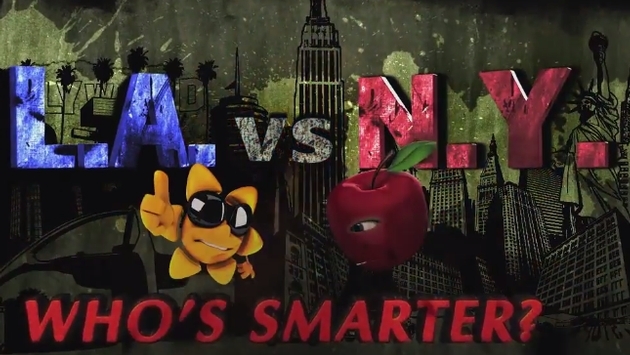 We finally have some closure as to which American metropolis houses the smartest people, New York or Los Angeles. Let’s call this one a draw and walk away, because this Angeleno would rather the spotlight fall on some other town. Of course, when a camera is pointed on your face and you are asked a question, most people might have difficulty recalling their own name. Still, Kimmel’s person on the streets was throwing some easy softball batting practice with these questions, including a trick question that only becomes apparent when Kardashians are mentioned, which should really annoy most of you out there. That means the brain is set to the off position until America’s favorite family is mentioned. All of this should prove one thing, and it’s not which city plays host to the smartest people. Rather, it’s that the second you see a camera and a microphone, you should walk the other way. You will only bring grief to yourself and anyone who knows you once you decide to go on camera and answer some questions. Unless, of course, you haven’t killed the remaining brain cells that know what I.Q. means.